My favorite part about the keto diet is the amazing food that you can eat every day without any guilt. One of those foods I love is Keto Sausage Balls because they are so easy to make and full of flavor. To change things up a bit from my usual I concocted these Spicy Keto Sausage Balls – and now it is hard to decide which is my favorite! I have to admit, before starting keto, the very idea of sausage grossed me out. I am not a huge fan of processed meat. But after a while of enjoying my Sausage Egg Bakes for breakfast, I decided to get a bit more creative, and made my Sausage Cheese Balls… and I have been hooked ever since. 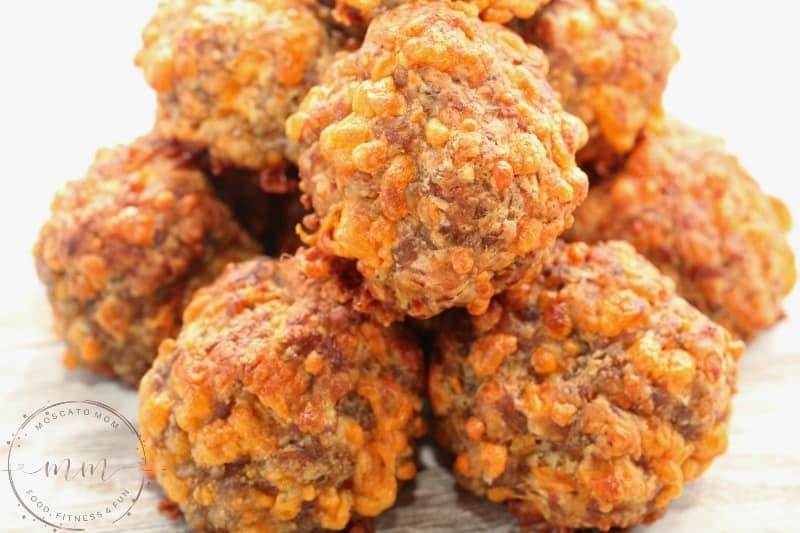 There are a lot of Sausage Ball Recipes that use flour – but it is not necessary. In fact, I use grated parmesan in place of flour in several recipes – like Fathead pizza dough! It brings the carb count down significantly and adds even more flavor! A total win-win. 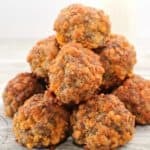 This recipe makes 24 bite-sized Sausage Balls that are great for snacking or to take to a party for a Keto Appetizer. 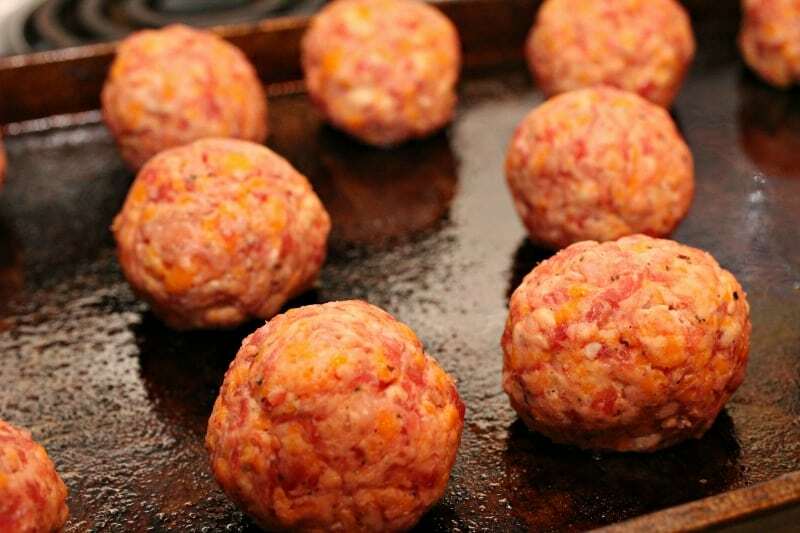 Each little sausage ball has about 1 carb each, so they are easy to work into your daily macros. They are delicious alone or dipped into my Keto Ranch Dressing – which cools off the spice some for an amazing savory flavor. It is a good thing they are so low in carbs – because I will warn you – once you start eating them, it is hard to stop! 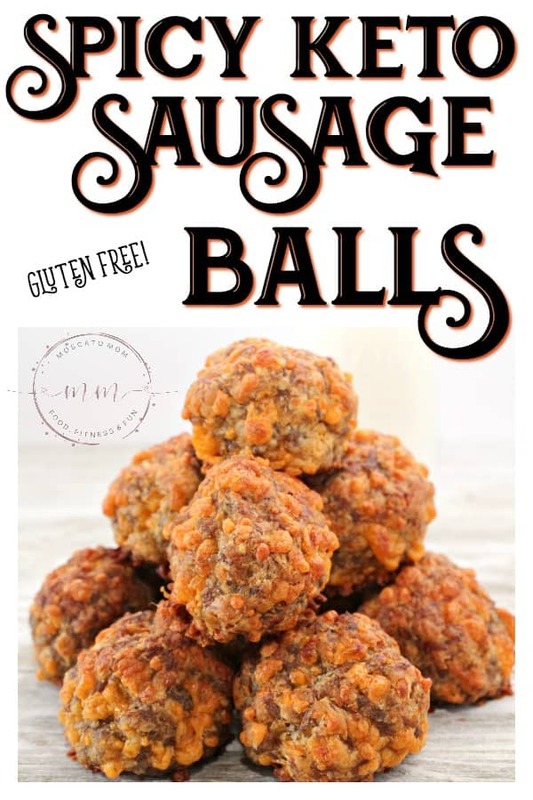 Each Spicy Keto Sausage Ball has 0 net carbs, 0 total carbs, 0 fiber, 8 g fat, 6 g protein, and 104 calories. This gives them an “A” rating! In a large mixing bowl, add all ingredients, add water in 1 tablespoon at a time until all ingredients are wet. Knead all ingredients until mixed well. Roll mixture into balls and place on greased baking sheet. 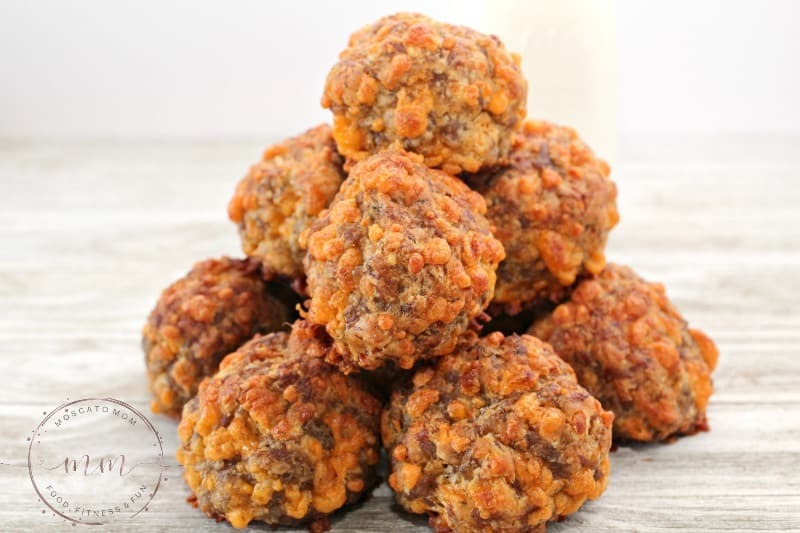 The perfect keto appetizer - Spicy Keto Sausage Balls! This will be a crowd favorite - even if they are not keto! Also great for snacking! I made these last night. They were really good, but maybe next time I’ll only put a cup of the Parmesan instead of a cup & a half. It was a little overpowering. I agree. And a better grade of sausage. But very good! Thank you for a great substitute for diabetics. I’m wondering why the carb count is so high? Maybe its the grated cheddar because they use potato starch when grating it? If I grated my own then I think it would be way lower in carbs. Excited to try this!